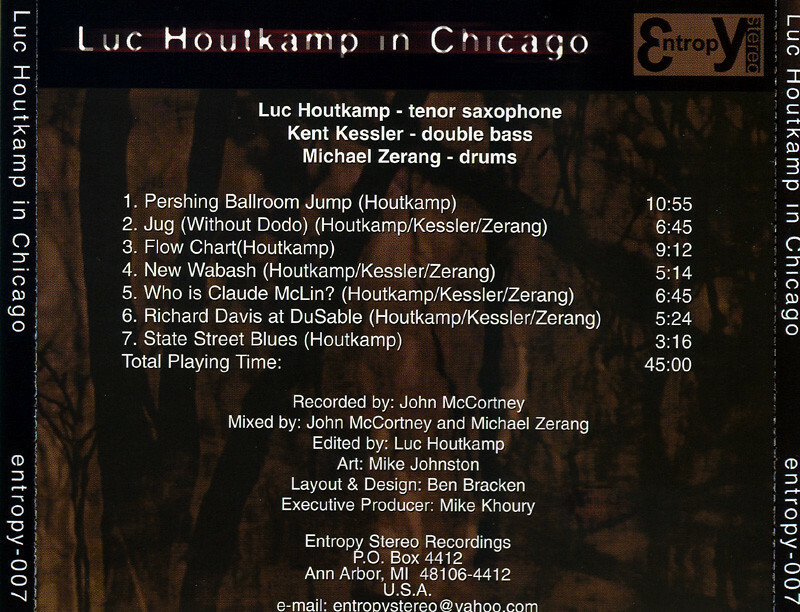 This disc represents the first American release for Dutch saxophonist Luc Houtkamp. Here, he appears with Chicago stalwarts Kent Kessler (double bass) and Michael Zerang (drums) in a 1997 studio date. Liner notes by Ken Vandermark, and artwork by Northwoods’ Mike Johnston. It’s interesting how one’s path of jazz listening arrives at a particular artist. 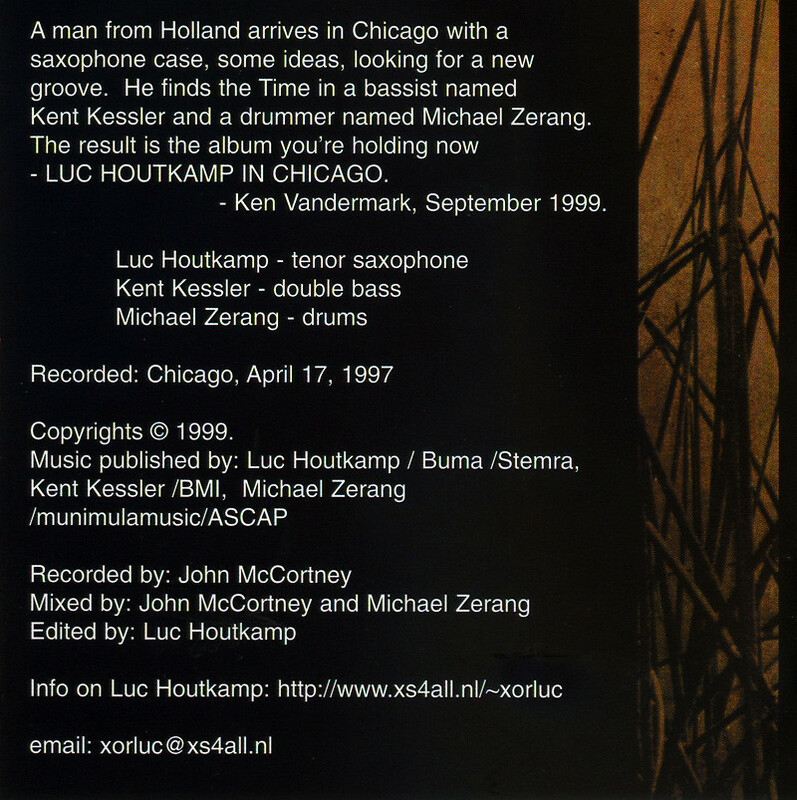 My personal discovery of Netherlands-born saxophonist Luc Houtkamp came via Chicago. Well, actually Germany and Peter Brötzmann. The 1960s free-jazz flame-thrower was travelling to the windy city to play a series of concerts and mentioned the thriving scene that grew up around Ken Vandermark. My discovery of Vandermark’s music led me to his influences in Europe and Swedish saxophonist Mats Gustafsson. You see the Chicago scene draws heavily from Dutch jazz (thanks to among others, John Corbett) and the likes of Han Bennink, Misha Mengelberg, and Willem Breuker. All three have been associates of Brötzmann, at one time or another. 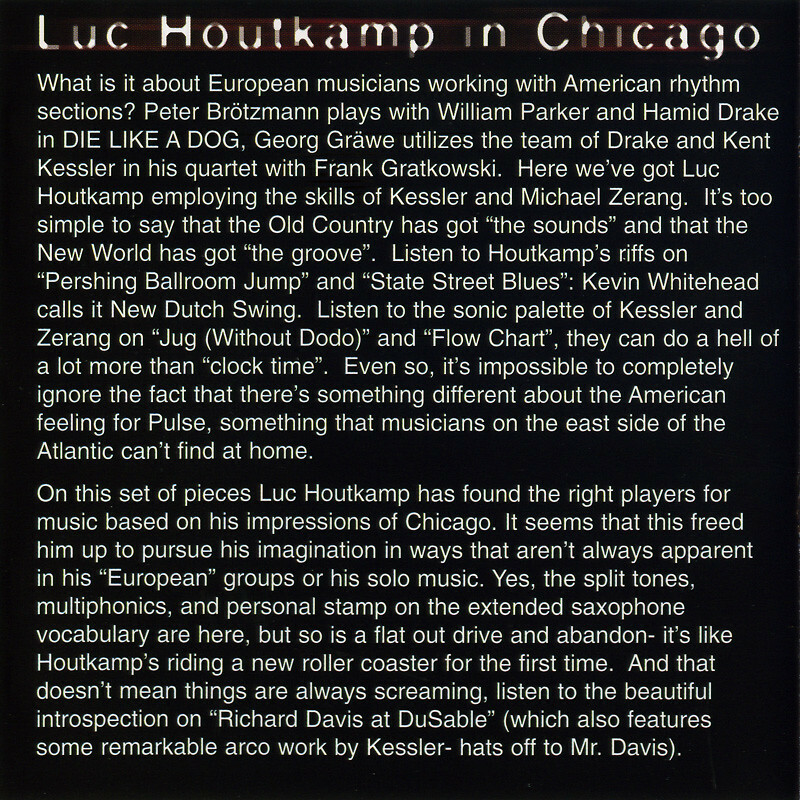 The Chicago connection to Amsterdam has led my ears to the fantastic Luc Houtkamp. Then Luc Houtkamp visited Chicago and the circle seemed complete. 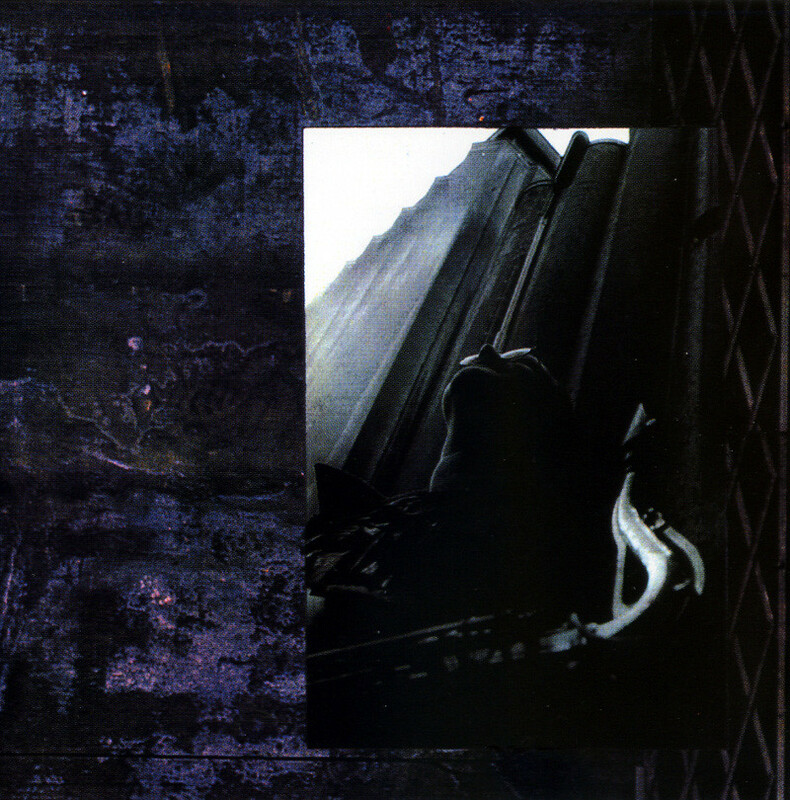 This recording from 1997 finds him in company of long time DKV, NRG and Vandermark 5 bassist Kent Kessler and Chicago drummer Michael Zerang (Brötzmann Tentet). Houtkamp, a largely self-taught saxophone practitioner, is also a composer of electronic and computer interfacing for improvisers. His records are available on his own Dutch X-OR label. Here he sticks to an all-acoustic attack by tenor saxophone. I’d describe his playing as a kinder, gentler Brötzmann blended with a more imaginative James Carter. His extended saxophone techniques of squawking, slap tongue, and multi-phonics are metered out in a patient almost relaxed manner. The trio shows their Chicago influences with the rolling “State Street Blues” and the romping “Pershing Ballroom Jump” both taking a page from Fred Anderson’s book. Houtkamp can be muscular when it’s called for and quietly pensive at times. You have to like the way this trio mixes the two. On “Jug (Without Dodo)” they move away from a defined pulse yet make a coherent highly interactive statement. Houtkamp throughout paces his performance with perfect timing and restrained outrageousness. Finding this voice might be the highlight of my year. I’m sure I would have got here sooner or later as America’s creative musicians reach out further for allies and more importantly new influences.